Affordable and Flexible. Attend classes by the hour or attend our complete program - payment plans available. A New Career Path. Potential for a unique career doing something you love. Comprehensive Curriculum. Study and learn Astrology, Directionology, Landform and Topography, Eastern Cosmology and how to hone your intuition. Feng shui is primarily concerned with the movement and containment of qi (energy) as well as the relationship between heaven (vibrational world), earth (our environment) and humanity (us). More simply put, feng shui examines the nature of change — with practical applications from interior design and architecture to traditional Chinese medicine and spiritual practice. GGFSS offers a broad yet comprehensive view of an incredibly complex system of understanding of the cosmos. Our curriculum seeks to present a vivid entry point and a strong foundation for the appreciation and practice this ancient art. We give students the options to delve deeply or to gain a more general understanding of feng shui. This class surveys history in central and northern Asia. Focusing on the human relationship to nature, we follow the transition of nomadic life to sedentary agricultural life at the foundation of Chinese civilization. Upon completion, students will have insight into the unique history of TCFS. Our understanding of cosmology is examined as it applies to the practical application of TCFS. The central principles of yin and yang, five elements, and qi are explored in relationship to room analysis and optimal qi circulation as students begin to develop practical skills for making feng shui recommendations. Ming gua and bazhai compass methods are used for determining the auspicious and inauspicious locations and directions for individuals and structures. We will explore the supportive positions for optimum potential in areas of business, health, relationships, and sleep. Nine Star Ki is the Japanese name of a system also used by the Chinese and the Tibetans. Those unfamiliar with astrology can apply its wisdom; and at the same time, seasoned astrologers and practitioners of feng shui will deepen their elemental understanding and how the elements effect communication at home and work. For feng shui practitioners Nine Star Ki helps explain why clients communicate the way they do and why particular clients can work with some solutions and ideas better than others. In this course students will begin to develop the skills they need as a consultant and the understanding personality traits of their clients. We will also explore Nine Star Ki directionology for travel and moving. Students will be introduced to how to read the lay of the land and understand its influence on human life, as another aspect of the art of choosing auspicious locations for activities, buildings and settlements. Overview of geomancy, the western cousin of feng shui, with its broad multi-disciplinary approach to living in harmony with the Earth, and strengthening our sense of place and community. Explore how to hear the "story of a place" to understand the essential personality of a region and how it creates local human culture, from the perspectives of regional geomancy land form feng shui and your intuitive emotional responses to the environs. This class will give students analytical procedures and checklists to help them evaluate the inherent properties of a landscape, and experience how knowing what to look for increases their powers of observation. 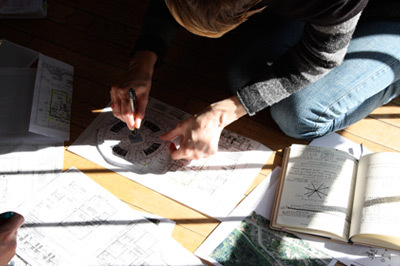 In this class, students will learn how to read and create floor plans to scale. Floor plans are essential for working with the lopan compass as well as helpful in understanding the size and scale of interior environments and the relationships between various spaces. In feng shui and design applications a good floor plan offers clients and practitioners a valuable perspective and a practical way to engage the space they are working with.